For UW-Green Bay student Vanya Koepke, a meeting over coffee might have helped to solidify his future career. The conversation sparked a desire in Koepke to become even more involved. “After talking with him I was just really inspired to dive into this as soon as possible,” he said. A series of events after this initial meeting led Koepke, a double major in Political Science and Public Administration, to accept an internship as an assistant to the Mayor’s Chief of Staff. 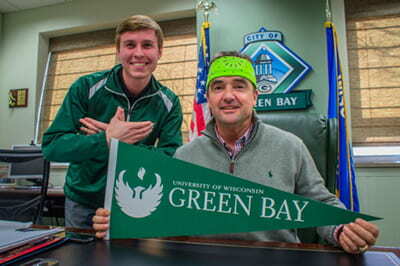 (Above, Green Bay Mayor Jim Schmitt and Koepke show their Phoenix pride). Koepke, who is also the UW-Green Bay Student Government Association President, began the internship in January 2015. As an assistant to the Mayor’s Chief of Staff, Koepke’s main job is to work on the State of the City address that the mayor gives annually in March. This internship is Koepke’s second. He previously interned in the De Pere Planning and Zoning Department, where he compiled the sustainability report. Koepke will be graduating in May 2015 and hoped to further enhance his education by taking on this new opportunity during the spring semester. This experience translates directly into what Koepke plans to do in the future. Koepke feels that when UW-Green Bay students pursue internships they not only set themselves apart, but also build a stronger Green Bay community. For Koepke, the experience itself has been positive. This entry was posted in Leading & Learning and tagged internship, Political Science, Public Administration, Student Government Association on March 20, 2015 by Sue Bodilly.